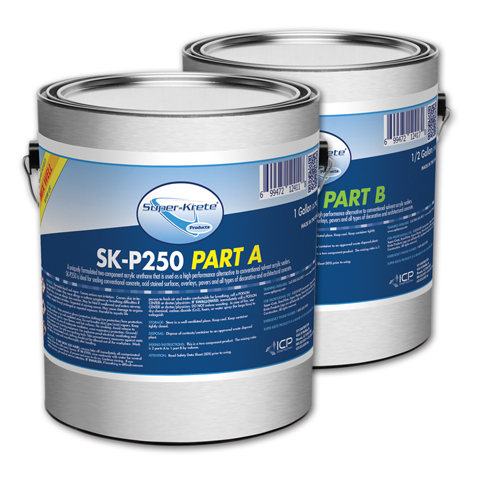 SK-P250 is a two component, low viscosity acrylic urethane. It is used as a primer/sealer over a variety of surfaces. The use of special solvents and adhesion promoters gives this material excellent penetration and adhesion to minimally profiled concrete. SK-P250 is U.V. stable for use in exterior applications, cures rapidly and is easily recoated with both solvent-based and water-based polyurethanes. When used as a finish coat, this material gives a hard, high gloss surface that offers excellent stain resistance and easy cleanability. Compared to solvent-based acrylic sealers, SK-P250 offers substantial improvements in initial gloss, gloss retention and overall performance. SK-P250 is available in a satin finish if a lower gloss is desired. A special version of this material is available to meet the 50 grams/liter VOC limit in California.